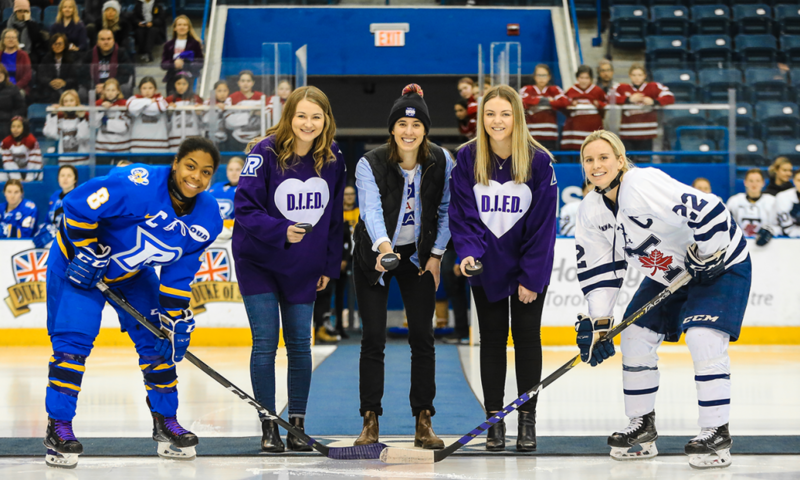 When Ryerson’s women’s hockey team took the ice on Saturday, the game was about much more than just winning. This was the team’s fifth annual “Do it For Daron” (DIFD) fundraiser. In partnership with DIFD, the game is turned into an afternoon of raising awareness for youth mental health. Olivia Giardetti, a second-year forward, said that being a part of the women’s hockey team has changed her view on mental health because all the girls on the team are so open and there’s always someone to talk to. Do it For Daron is an initiative founded by Luke and Stephanie Richardson, Daron’s parents, in 2010 after she ended her life at the age of 14. The goal behind Do it For Daron is to open the conversation and support youth struggling with mental illness. Each year to kick off the game, the team chooses two individuals to drop the puck. This year, the puck was dropped by two former Rams players who started the DIFD fundraiser for the team. There was also raffle prizes that had been donated from families and companies, and women’s soccer hosted a bake sale. All proceeds went to DIFD. According to the Canadian Mental Health Association (CAMH), in 2016, suicide accounted for 19 per cent of deaths among youth aged 10 to 14 and 29 per cent among youth aged 15 to 19. They also reported that 70 per cent of mental health issues have their onset during childhood or adolescence. Laura Ball, a fourth-year defender, said that it’s important to recognize that you can never be too young to suffer from a mental illness. She said this is another reason why it’s important for younger teams to come out to the DFID game to spread greater awareness. Being student athletes, Ball said people think they have it easier than other students. However, that is not the case. This year Ryerson Athletics introduced the Rams Talk Mental Health Resilience and Support Award. This award was created by former Ryerson Rams women’s hockey player, Janella Brodett, who started the #RamsTalk campaign while she was a student. The award aims to decrease the stigma related to mental health struggles and mental illness within sport. The recipient this year was Elexa Pakozdy, a third-year forward for the women’s hockey team. The total donation amount has not yet been finalized but the team has a rough estimate of around $3,370. The Rams won the game, defeating the University of Toronto 6-5 in overtime.